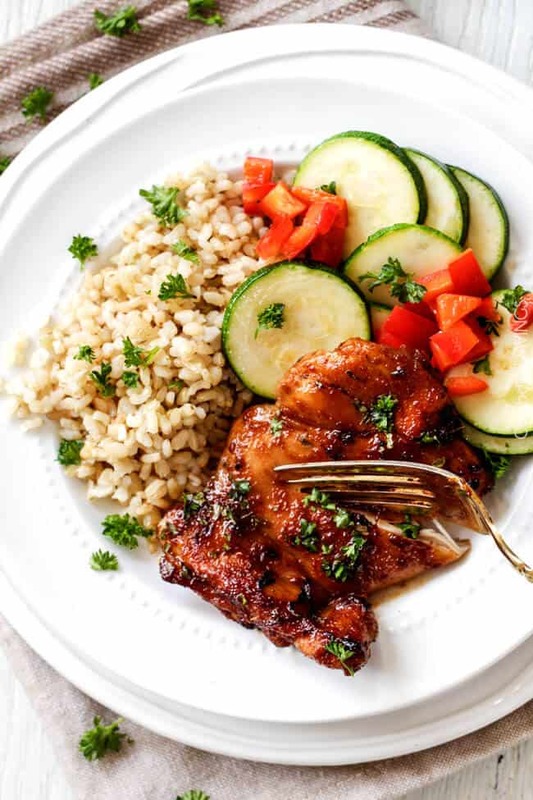 Sweet, Spicy (optional) and Tangy Honey Dijon Glazed Chicken is quick and easy and packed with flavor! 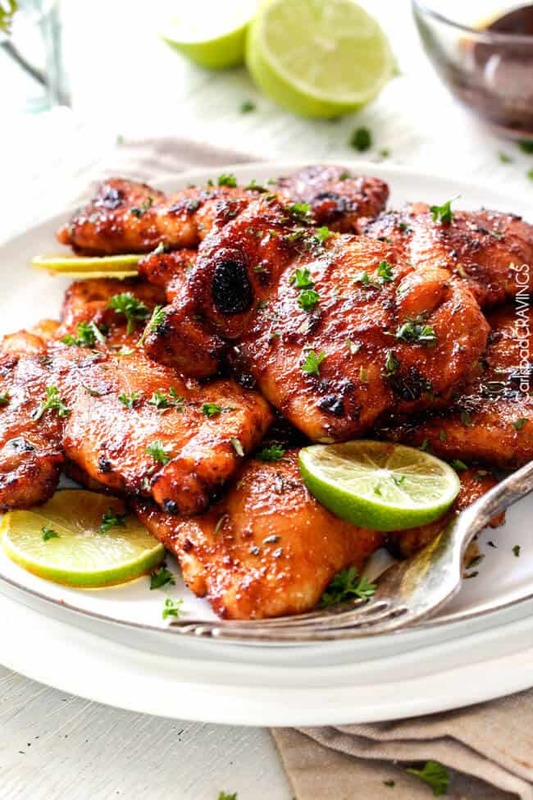 The chicken thighs are rubbed in spices, cooked under the broiler for 12 minutes and glazed with the most incredible sauce! It is practically Spring, which means its practically summer, which means its almost time to get out the grill! Isn’t it crazy how time flies! Pretty soon I am going to be swapping all my slow cooker and soup recipes for grills, marinades and salads. 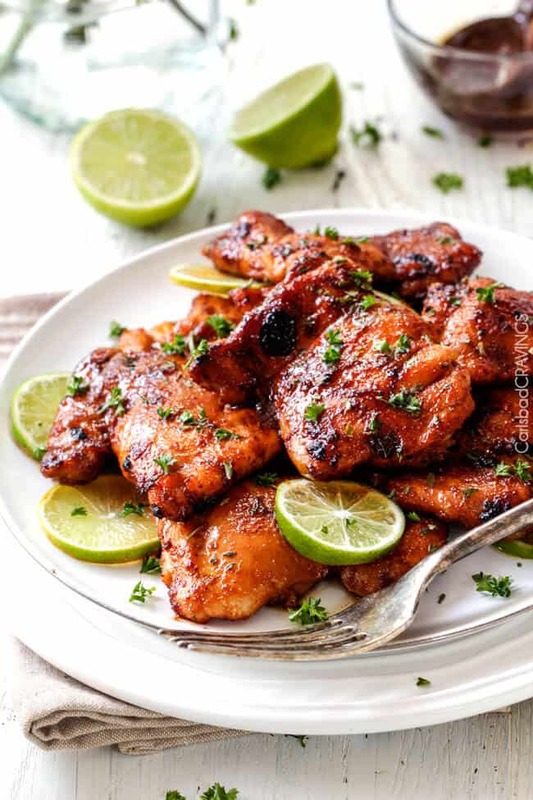 In the meantime, however, I want to share my new favorite method of preparing chicken when it has a spice rub and a glaze but its too cold to grill, don’t have a grill, or you simply want to cook indoors. I discovered this method from Cooking Light and I cannot believe how easy it is. It might be old news to a lot of you, but it is old news worth getting giddy over. 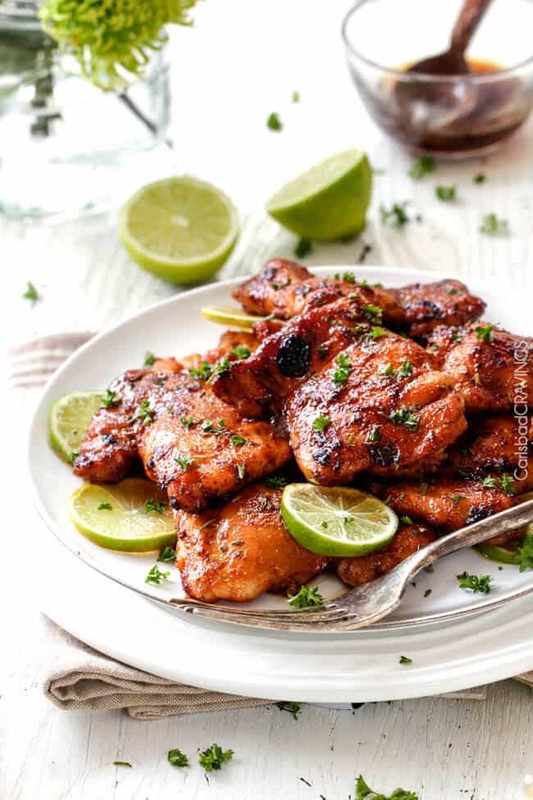 You simply rub chicken thighs with olive oil combined with your favorite spice rub and broil for 6 minutes on each side – that’s it! You can glaze the chicken with whatever you like half way through cooking and/or at the end of cooking. Dinner was never so easy. Giddy, no? 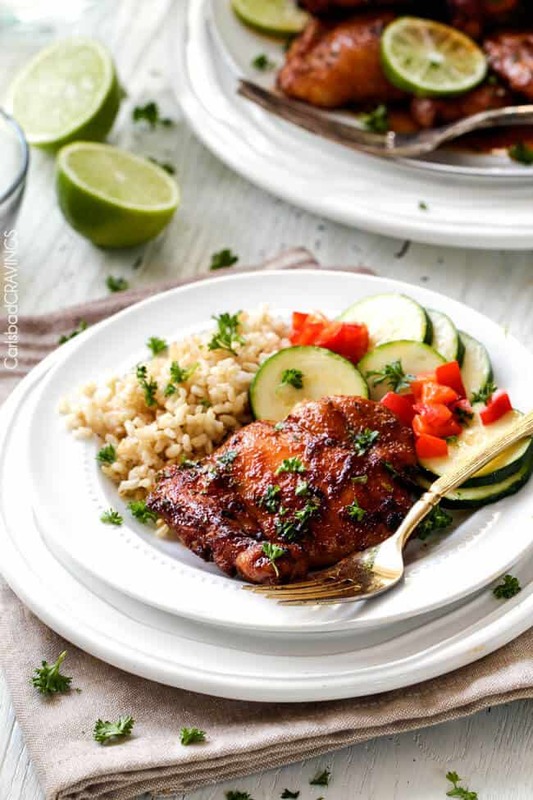 Now just a word about this cooking method – it is important that you use boneless, skinless chicken thighs instead of chicken breasts. 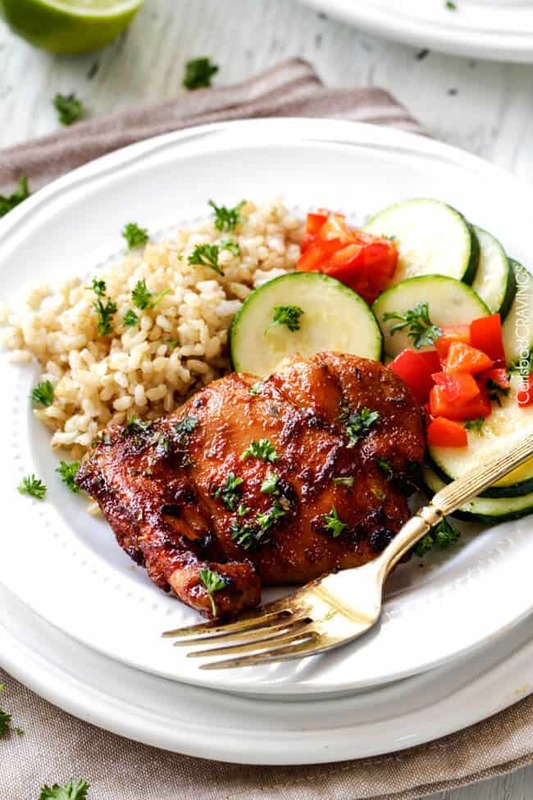 Not only are chicken thighs more flavorful, but most importantly, they will remain tender and juicy after cooking at such a a high temperature whereas chicken breasts will dry out. You will want to trim your chicken thighs of excess fat before smothering in the rub. I like to use my kitchen shears to make this super quick. 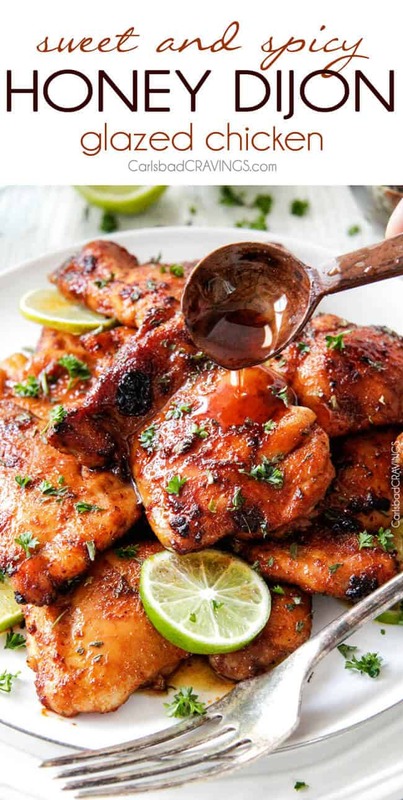 To make this scrumdidilouso Honey Dijon Glazed Chicken, combine olive oil, garlic powder, onion powder, chili powder, cumin, regular paprika and smoked paprika and chipotle powder in a bowl then rub it all over your chicken. If you don’t like spice at all, you can can completely omit the chipotle chili powder but I don’t find 1/2 teaspoon very spicy and would still consider it family friendly. If you love spicy, you can increase the chipotle chili powder to 1 teaspoon. Broil chicken for 6 minutes per side, then brush with your Honey Dijon Sauce and broil for 1-2 more minute or until nicely browned. That’s it for easy peasy and so delish Honey Dijon Glazed Chicken! The chicken alone is tender, juicy and packed with flavor. The Honey Dijon Sauce is sweet and tangy and intoxicating delicious. Together, they will blow your mind. The Honey Dijon Sauce is a simple whisking of honey, Dijon mustard, yellow mustard, apple cider vinegar and a splash of lemon juice. It is sweet with a punch of acidity to balance out the honey and perfectly compliments the bold rub spices. And and dig in to juicy Honey Dijon Glazed Chicken! 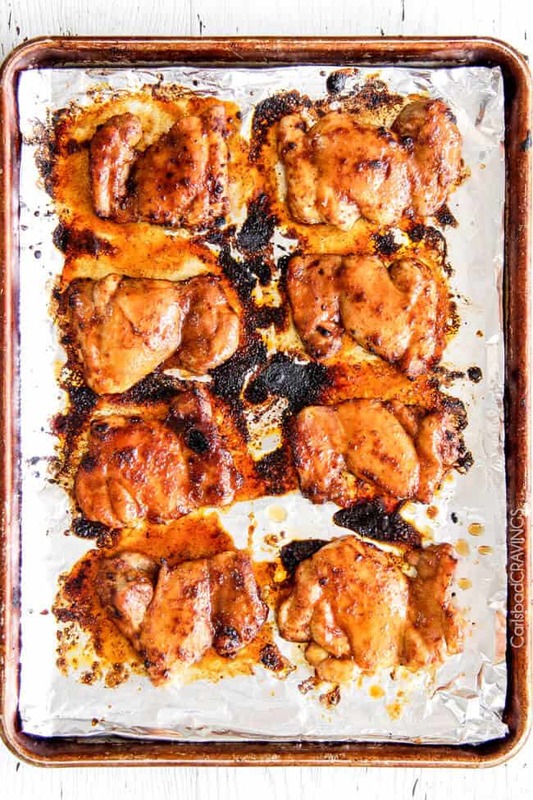 Want to try this Sweet and Spicy Honey Dijon Glazed Chicken? Line a baking sheet with foil (not parchment paper) and lightly spray with cooking spray. Set aside. In a medium bowl, whisk together the Chicken Rub Ingredients and evenly rub all over chicken. 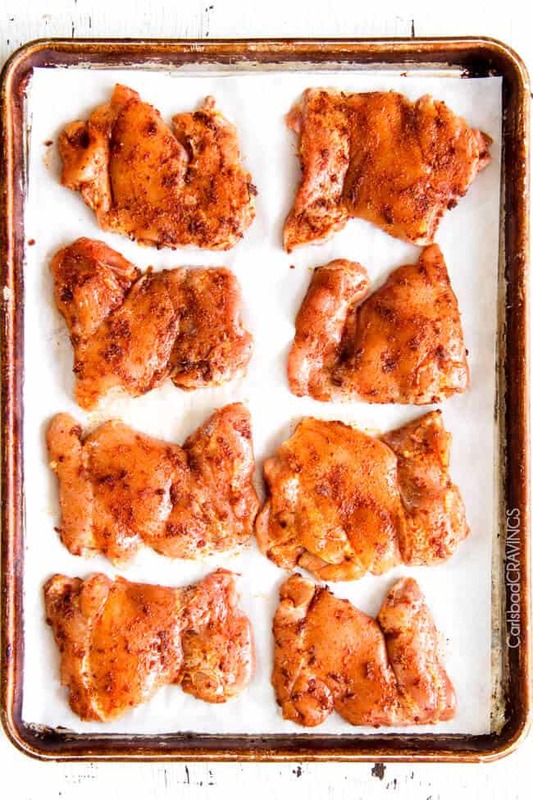 Place chicken on prepared baking sheet. Move oven rack to top position and broil chicken for 6 minutes on each side (12 minutes total). Meanwhile, in a small bowl, whisk together the Honey Dijon Sauce ingredients. Remove chicken from oven and brush top side with Honey Dijon Sauce; broil 1-2 minutes or until chicken is cooked through. Brush individual servings with remaining Honey Dijon Sauce as desired. 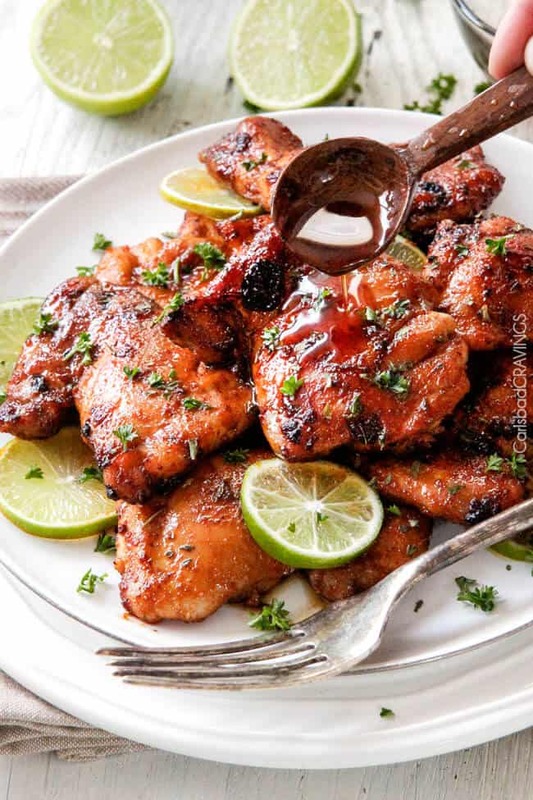 *It is not too spicy with only 1/2 teaspoon chipotle chile powder - just flavorful. If you really like heat, then increase chipotle chile powder to 1 teaspoon. **For even more flavorful chicken, cover with rub and refrigerate up to 24 hours then bring to room temperature before broiling. So flavorful and i use the sauce for salad dressing. Yum! That is a brilliant idea to use the sauce for salad dressing – I wouldn’t have thought of that but now I am plotting! Thanks for a great idea! So good ty. My chicken.came out perfect. You are so welcome Mandy, I’m thrilled it was a hit! Thanks for taking the time to comment! 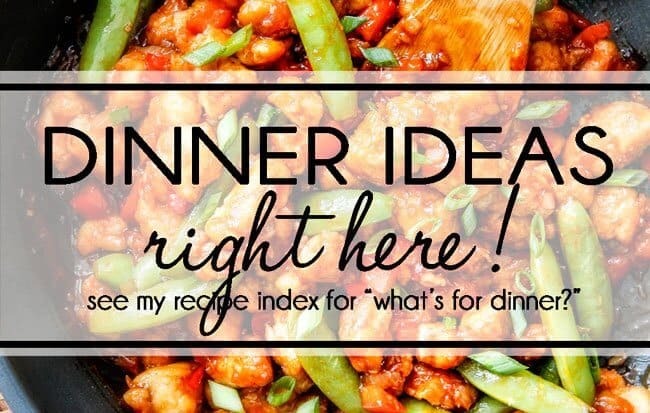 I love this recipe but what would you serve with this to make it a dinner with friends? 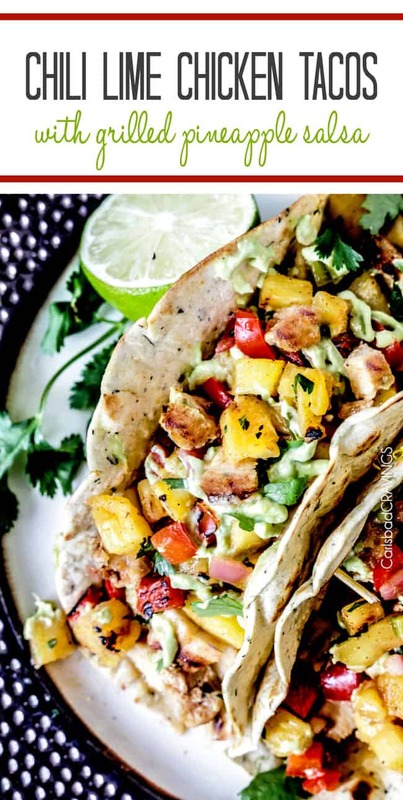 Hi Cyndi, I’m so happy you love this recipe! You could serve it with a big green salad and pineapple to keep it simple or any of my sides here: https://carlsbadcravings.com/recipes/recipe-index/sides-and-lighter-fare/ such as Pina Colada Fruit Salad and Brown Butter Asparagus. enjoy! I only had breasts in the fridge and *someone* forgot to tell me they’d thrown out the last of the dijon from the fridge, so I had to improvise 🙂 I added Keen’s dry mustard powder in place of the missing dijon and I put the rub on the chicken breasts and cooked them en papillote. Then I took them out and put on a baking sheet sprayed with olive oil, brushed them with the sauce and broiled. They were still lovely and tender and my son said it was the best chicken he’d ever had. I was a little less enthused and really feel it did need the dijon and will for sure use some thighs next time, I’m sure they’ll be delicious! Served with the men’s favourite (I’m Canadian, we put a ‘u’ with everything, ha ha!) baked cauliflower and an apple walnut greens salad. Thanks for the recipe! 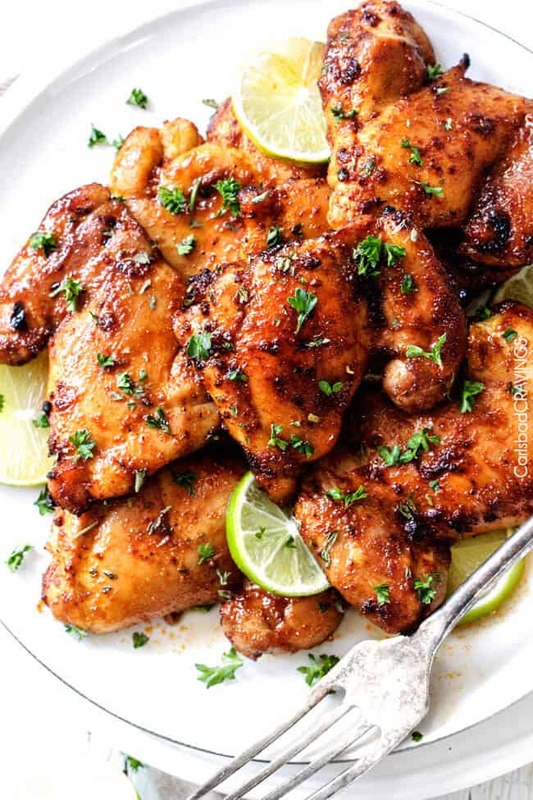 Hi Tracey, I’m so happy your son said it was the “best chicken he’d ever had!” and hopefully next time with the Dijon and chicken thighs you will feel the same 🙂 You whole meal sounds delicious!